Sara Miller London launched in 2016 and has rapidly become of the UK's fastest growing lifestyle brands. Sara's designs and patterns have always been influenced by her passion for travel and experiencing different cultures. These stunning Sara Miller earrings feature 5 delicate chains that fall from a small cluster of leaves. 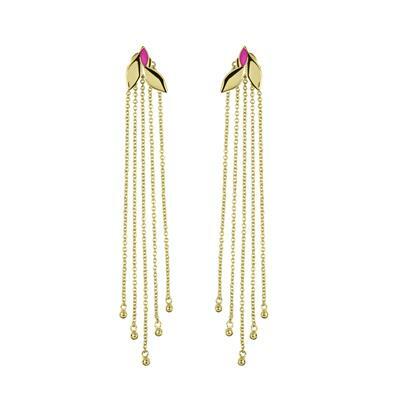 One of the leaves are bright pink which adds a pop of colour to the earrings and gives them a feminine edge. Wear these beautiful drop earrings with any outfit to add glamour and style!